A few weeks ago, I was taking a walk around a neighborhood in Seattle. It was one of those gorgeous (rare) sunny winter days, cold and crisp. The Olympic mountain range was glowing in all its snow-capped glory in the distance and I was trying to soak in as much of the sun on my cold face as I could. It was then when I stumbled across an enormous persimmon tree. 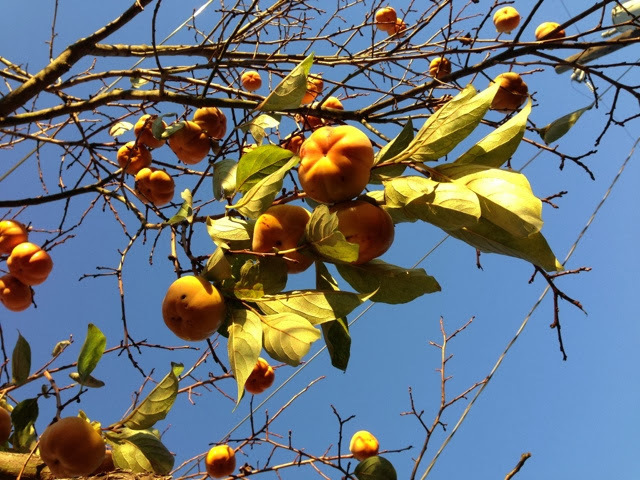 It had lost almost all of its leaves and just had these beautiful orange fruits hanging on to its branches. I was shocked that such a fruit could grow in this climate during this time of year. Amazing. And so, I was inspired to create this little breakfast bowl. Persimmons are one of those special fruits that pop up in certain markets this time of year, especially Asian markets. Someone once described them to me as "sugar bombs" because they are so darn sweet. Hey, if the sweetness is coming from a natural fruit and not a candy bar, I'm all in for a sugar bomb! I combined this sweet fruit with some tart pomegranate seeds in this creamy quinoa breakfast bowl. It was a nice change from my typical bowl of oatmeal in the morning. And man, was it pretty! Persimmon-Pomegranate Quinoa Breakfast Bowl is truly amazing.Ever anybody told you that you got superb writing style and you are great scene teller.I am telling you.Get tune on grademiners.com review as its best for writing training.